1780 Planisphaerium Coeleste Secundam Restitunionem Hevelianam et Hall - the Vintage Map Shop, Inc. This is a reproduction of a wonderful double hemisphere celestial chart showing the northern and southern skies. The map was originally created by Georg Christoph Eimmart in Augsburg, 1780 and later reissued by Johann Michael Probst in 1809. This elaborate star chart shows the northern and southern hemisphere constellations as allegorical figures, animals, scientific instruments, symbols and shapes. The style used is based on that of Johannes Hevelius a polish astronomer whose name is referenced in the subtitle just below the main chart. The British astronomer Edmund Halley who is known for his discovery of Halley’s Comet is also honored in the same banner. 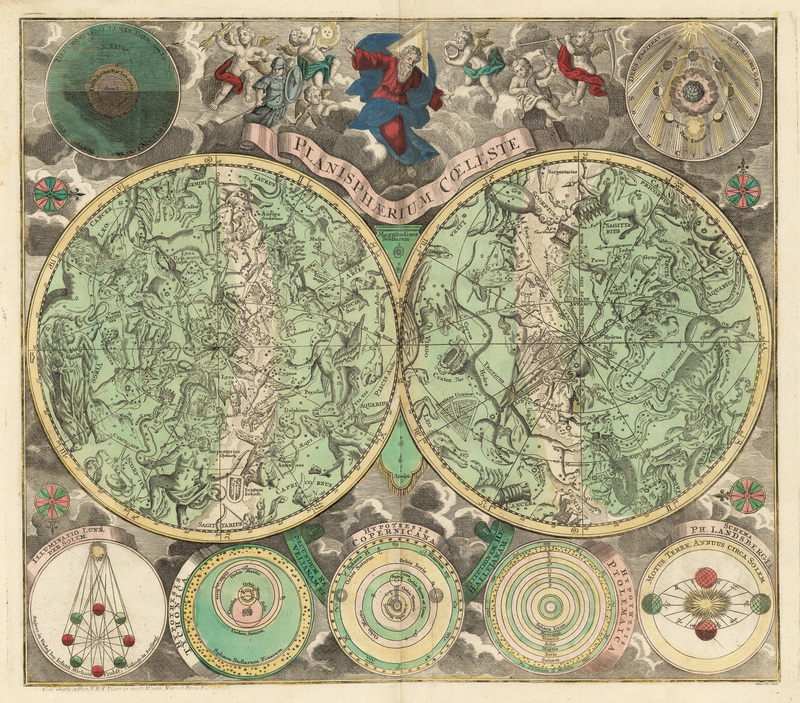 Surrounding the celestial chart are seven diagrams illustrating various solar phenomena and planetary models. These insert diagrams include phases of the moon as viewed from Earth (upper right), a simple diagram showing night and day (upper left) and from left to right along the bottom, the illumination of the moon by the sun; planetary models of Tycho Brahe, Copernicus, and Ptolemy, followed by Lansberg’s model of the elliptical motion of Earth around the sun. The chart and all diagrams are set in a bed of clouds and crowned by a deity-like male figure and seven putti holding various instruments, symbols, and weapons.